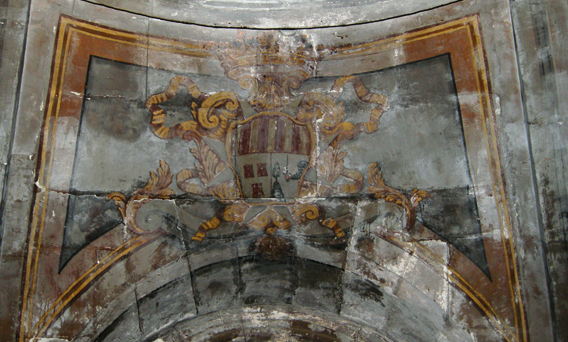 The greatest treasure of Victory Church is its vault ceiling painted by the Maltese baroque artist, Alessio Erardi in 1716 depicting episodes from the Life of the Virgin. 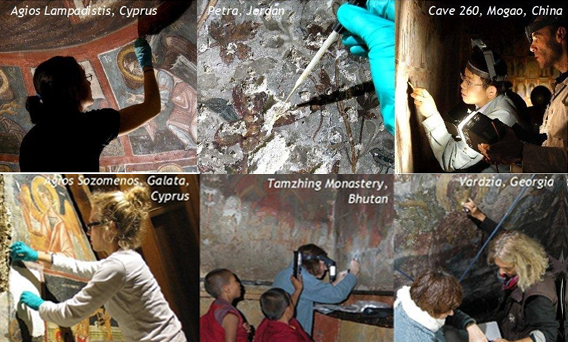 This is what the vault looked like in 2004 when treatment by Conservators from the Courtauld Institute of Art, London, began, coordinated then by the Valletta Rehabilitation Committee. 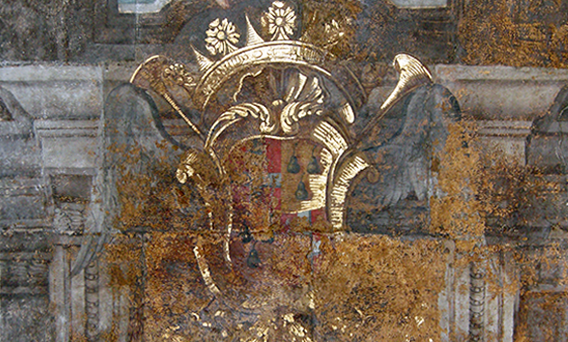 The Courtauld Institute of Art, London, is world leader in the teaching of history of art and conservation of wall and canvas paintings. 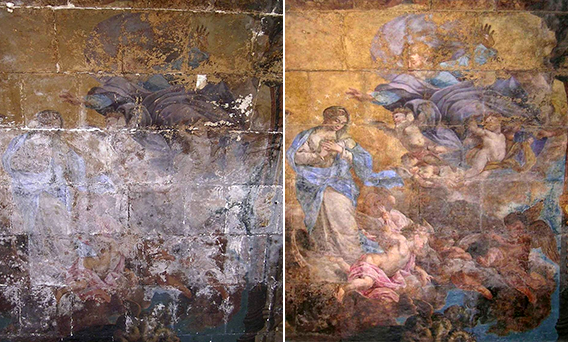 Between 2004 and 2008 their conservators saved 'The Immaculate Conception', 'The Assumption' and 'Victory' Segments of the ceiling. 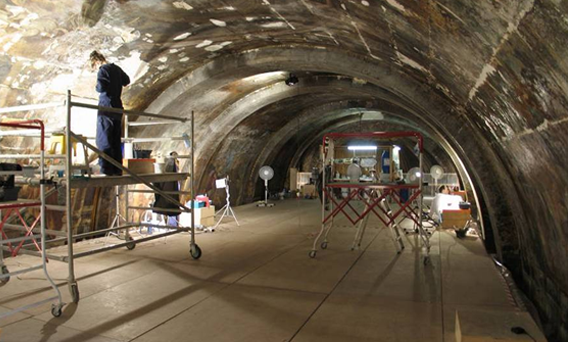 They continue today to work on the enormous challenge of saving the rest of the vault together with Din l-Art Ħelwa. 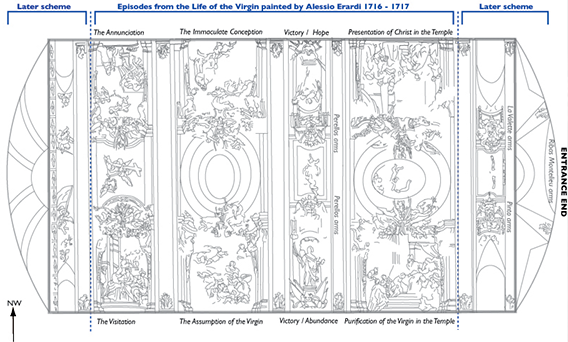 View the Map of the Alessio Erardi Vault Paintings, and see the sequence of images from the Life of the Virgin by Alessio Erardi who painted these between 1716 and 1718. 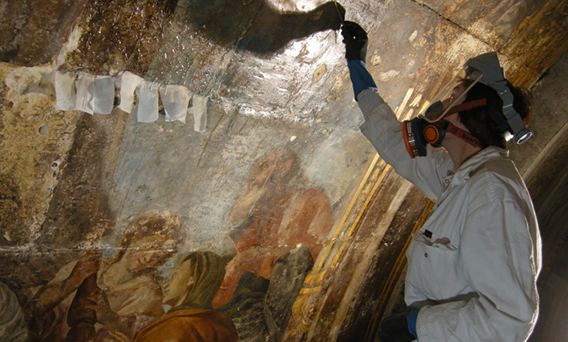 Senior Conservator Lisa Shekede at work on the vault. 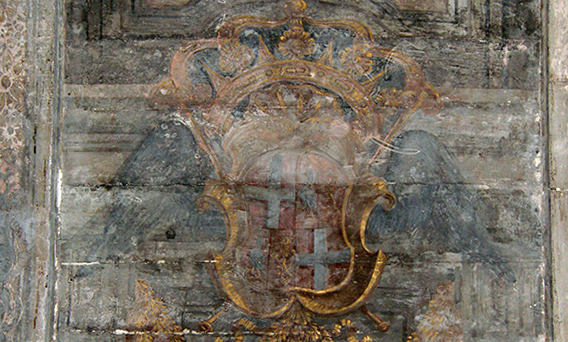 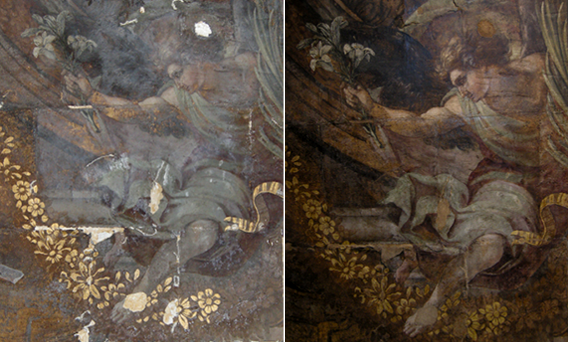 'The Assumption' before and after treatment and conservation. 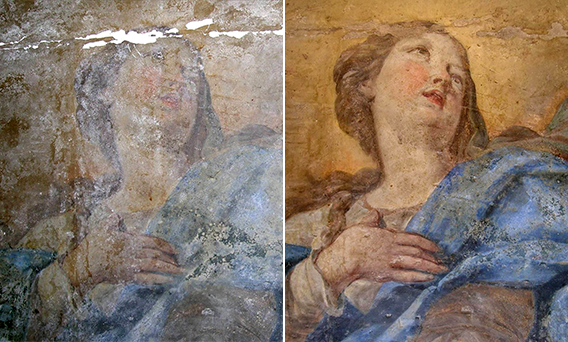 'The Immaculate Conception' before and after treatment and conservation. 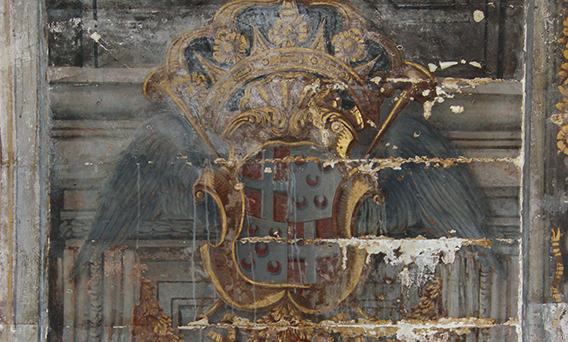 Cartouche segment before treatment and conservation. 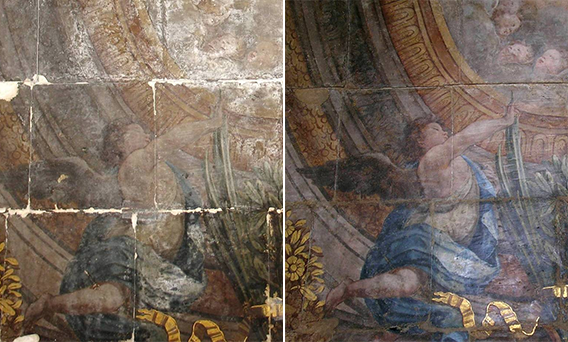 The Archangel Gabriel emerges, detail from 'The Presentation of the Virgin at the Temple', before and after conservation. 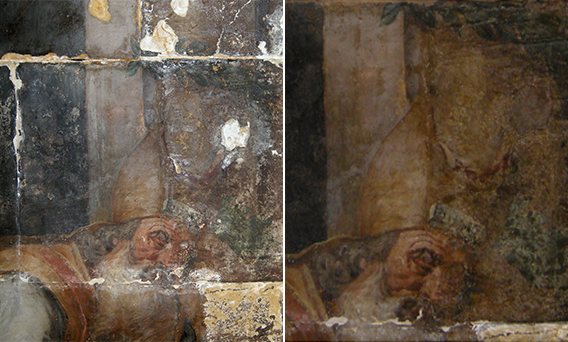 'The Patriarch Simeon' before and after conservation, detail from 'The Presentation of the Virgin at the Temple'. 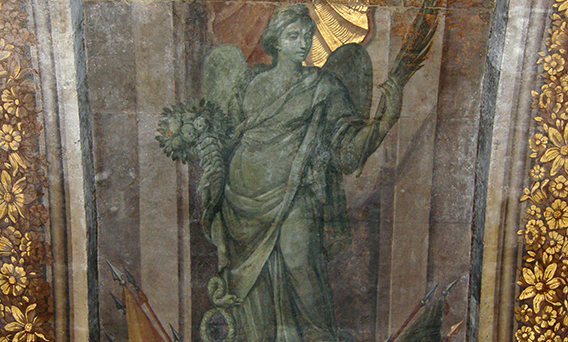 'Victory' after treatment, an allegorical representation on the ceiling by Alessio Erardi.